Get ready to protect your back and build a stronger core! Tour Tempo® presents Protect Your Back with Dr. Rob Jones and John Novosel Jr. The exercises included in this app will help you train your core properly without hurting your spine and without getting injured. Protect Your Back was created by a clinician with over 15 years of experience in helping his patients rid themselves of low back problems, permanently! With a clinical and scientific approach Protect Your Back explains and demonstrates how the lower back functions when it is healthy, exactly which exercises break it down and cause injury, how to correct some of these injuries with exercise and most importantly how to train the core (the group of very important muscles that protect the spine from injury) for a healthy and strong low back. Protect Your Back provides three clinician directed core workouts for the beginner that may have a weak core or may even be in pain and two intermediate core workouts that safely and properly train the core without using any of the “back breakers” exercises that are being used too often in exercise facilities across the country. Let Protect Your Back show you how to properly work your core to save your back. Recent testimonial about getting results with Protect Your Back. 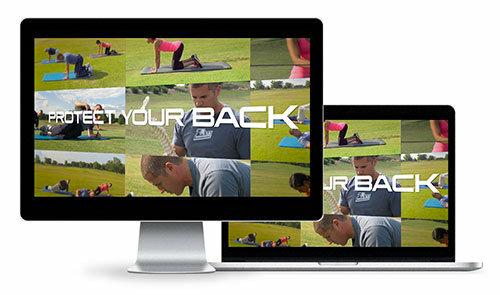 Hello John, I wanted to comment on the back exercise app produced by Dr. Jones and John Jr. (Protect Your Back). I’ve been seeking help in controlling back pain and biweekly adjustments weren’t enough. I purchased the app and from the first practice session found my back pain was reduced significantly. In the past 4 months I’ve received several messages from my chiropractor stating I am overdue for an adjustment. I still get an adjustment for hip rotation that locks once in a while but can attribute the better golf to “Protect Your Back” app ~~~ it truly works, thank you.